Organizations frequently cite the perceived cost of ergonomics programs and solutions as a barrier to implementation. While the benefits of ergonomics are fairly easy to quantify following implementation, they can be difficult to estimate when attempting to justify an investment in an ergonomics intervention. This is one of the reasons that the cost side of the equation tends to dominate the discussion of ergonomics. 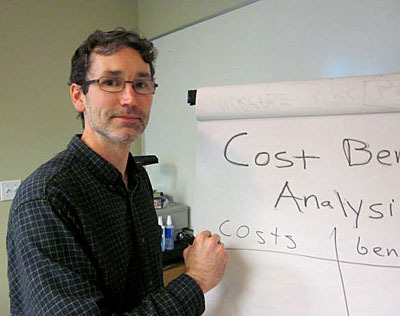 To help practitioners better quantify the benefits of ergonomics, Rick Goggins, a Labor and Industries ergonomist and PSHFES Council Member, has developed a cost-benefit calculator that PSHFES is proud to offer for free download. The calculator allows you to compare three intervention options, and provides estimates of benefits and payback periods. The calculator is based on a review of 250 case studies in which organizations reported the outcomes of ergonomics programs and individual solutions. Download the calculator and supporting documentation with the links below.